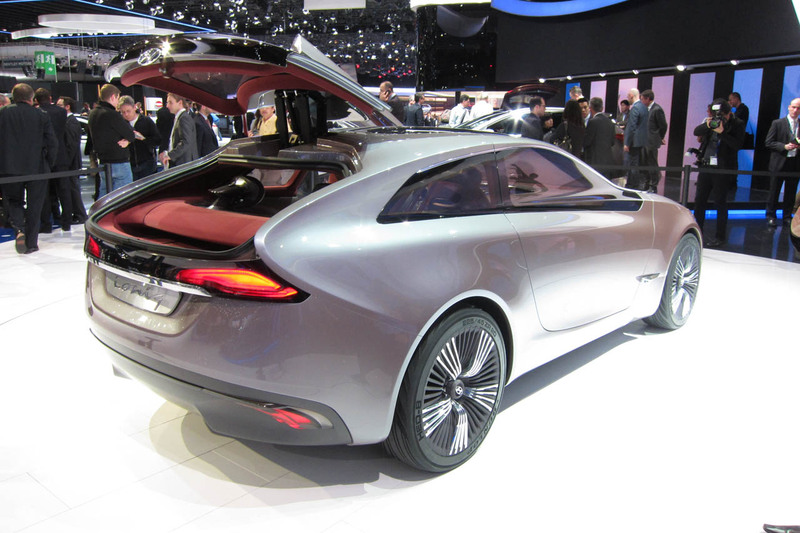 Hyundai teases i-oniq concept for 2012 Geneva Motor Show [Updated]. Updated with new complete information and live pictures. Hyundai has given a first glimpse of its new i-oniq concept car, which will preview the next evolution of the brand’s ‘fluidic sculpture’ form language. The i-oniq concept was designed and developed at the company’s European R&D centre in Rüsselsheim, Germany. More information about i-oniq will be revealed ahead of its world premiere at the 2012 Geneva Motor Show, held in a few days. Hyundai designers chose dynamic proportions to create i-oniq’s aesthetic and functional body shape. Its design combines gentle feature lines and muscular surface treatment, conveying premium and athletic qualities evident in both the exterior and interior of the car. Further design elements, such as the ‘penthouse roof’ and LED headlights, emphasise the advanced technology encased within i-oniq. The headlights emphasise the advanced technology of i-oniq. A uniquely-shaped polished aluminium frame houses the day-time running light and forms a unique signature light element. We attended to the official new Hyundai i30 event and party. 2012 Geneva Autoshow: Euro-spec Veloster Turbo announces 183 hp and more torque.